You can't use an ITIN to build credit and credit scores. 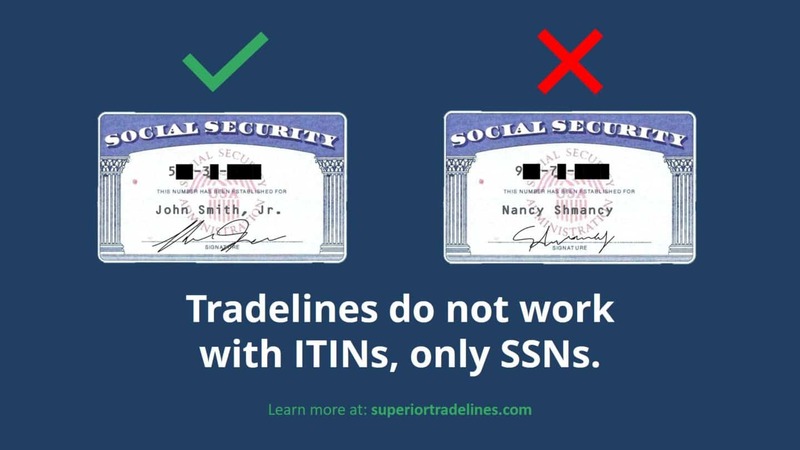 This concept – of tradelines and ITINS – originates from two scenarios: First, people think using ITINs is better than using CPNs (and SSNs, for that matter). Second, people who are legitimately eligible for an ITIN wish to build credit on their ITIN since they’re not eligible for an SSN. In both situations, the ITIN is not an option. ITINs and SSNs are noticeably different. You’re not going to sneak through an ITIN in place of your SSN. They are extremely easy to identify. Here’s the structure of an ITIN. That’s from the Statement Of James B. Lockhart, Deputy Commissioner For Social Security. Now we know how to identify an ITIN. Are you qualified for a social security number? 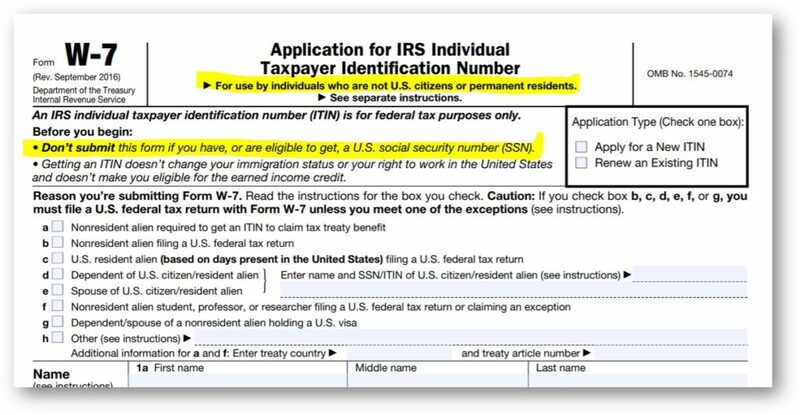 If you are qualified for a social security number, you are not eligible for an ITIN. This is true whether you have or whether you’re merely eligible for a social security number. Look at the top of the application for an ITIN. You can’t use an ITIN with Experian. Experian explicitly distinguishes social security numbers and individual tax identification numbers and makes clear an ITIN will be viewed as an invalid SSN if used to access credit reports. You can’t use an ITIN with Equifax. Equifax literally throws a fraud error if you attempt to retrieve a credit report from them using an ITIN. But, can I get credit? Since you can’t establish credit with an ITIN, you can’t establish a credit score. Since you can establish a credit score with an ITIN, a lender cannot evaluate your creditworthiness. Since a lender can’t evaluate your creditworthiness, you’re likely only to get starter credit cards (I.e, $300.00 limits) from a lender who accepts ITINs. Since those starter cards and credit won’t be reported to credit bureaus, you’ve done nothing to better your credit future. Credit report and scores with no numbers. Technically, you can get a credit report and score without an SSN or ITIN. To open a credit report, you just need a creditor (if you can get one) to report your account to the credit bureaus. Believe it or not, they do not need a social security number. They only need certain identifiable information about you, such as your name, date of birth, address, etc. Once you get a social security number, that previously unassociated information will attach to it. After six months of credit reporting, you can generate a credit score. Credit bureaus do not need a social security number or ITIN. They just need creditor data and some identifying data to connect it to. It means an ITIN isn’t helpful, anyway. ITINs are the subject of a massive congressionally required investigation. No, this investigation has nothing to do with credit. It has to do with wide-spread abuse of ITINs. There are recommendations to reduce the issuance and expedite the cancellation of fraudulently obtained and expired ITINs. As a result of this investigation, and other things, the authorities are phasing out ITINs if they’re not renewed as required by law. In other words, ITINs are slated for the chopping block in the form of expiration dates. You can learn more here. Why we don’t add tradelines to ITINs. This post stands as our policy paper on adding tradelines to ITINs. We won’t do it for the reasons listed above. We look forward to working for you and helping with your credit goals. Previous Post A credit hack that’s not nonsense. 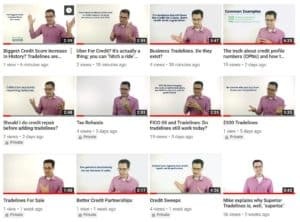 Next Post Tradelines for credit repair.